I’m obviously curious to know what Friedrich Wahle looked like. While research his catalog, I’ve been scouring for a known portrait. It looks like I may have found a little something – Wahle in caricature. It may not be the best physical likeness but it goes a long way to understand Wahle and his friends. The sketch comes from a biography  by Horst Uhr of Lovis Corinth (1858-1925) who was a well known German artist whose work ranged from Impressionism to Expressionism. Corinth moved to Munich in 1880 to study art at the Academy of Fine Arts. 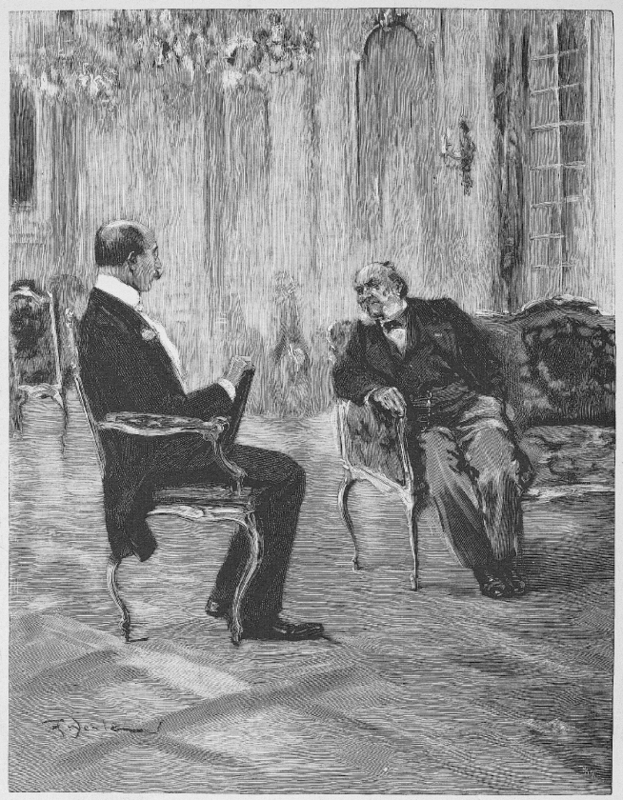 In 1884, he left for Antwerp, then Paris and finally returned to Munich in 1891. He was a member of the Secessionist (or modern art) movement which was founded shortly after his return to Munich. 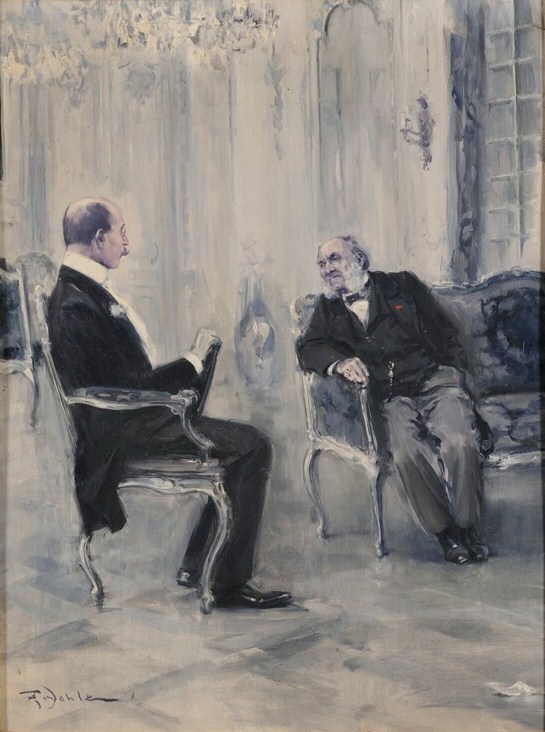 Five years older than Wahle, it is unclear if Lovis and Friedrich met each other at the Academy or through the active Munich art world, but by 1896 they have clearly become friends. 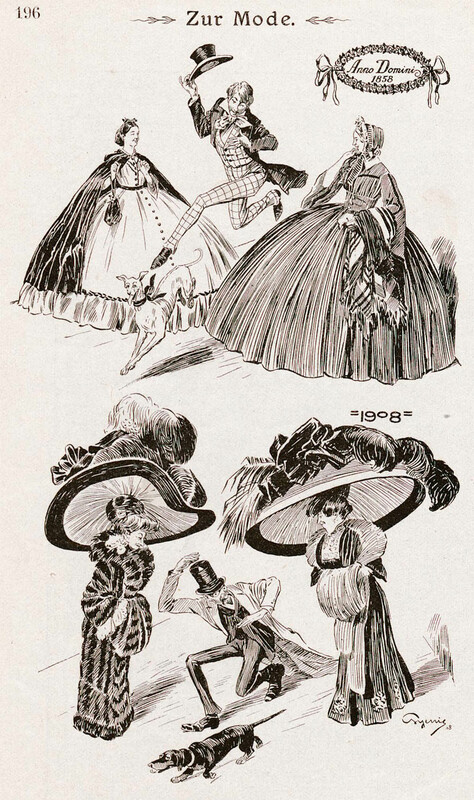 The caricature drawing by Lovis Corinth was completed around 1896. The upper right figure is a self-portrait of Corinth. The central figure is Benno Becker (1860-1938) a painter, art collector, art critic and founding member of the Secessionist movement in Munich. 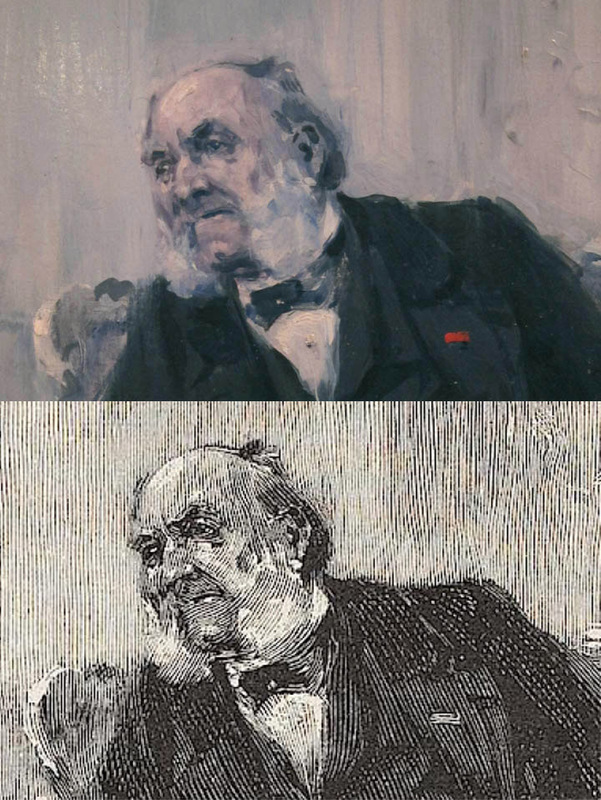 The lower left figure in profile is Hermann Eichfield (1845-1917). After a stint in the Prussian army, Eichfield came to Munich to study art, contributed to literary magazines and was a founding member of the Secessionist movement. Finally, in the upper left is Friedrich Wahle. It’s important here to note a distinction between the two artistic movements in Germany during the late 19th century: the Secessionists and the the Jugendstil (or Art Nouveau). 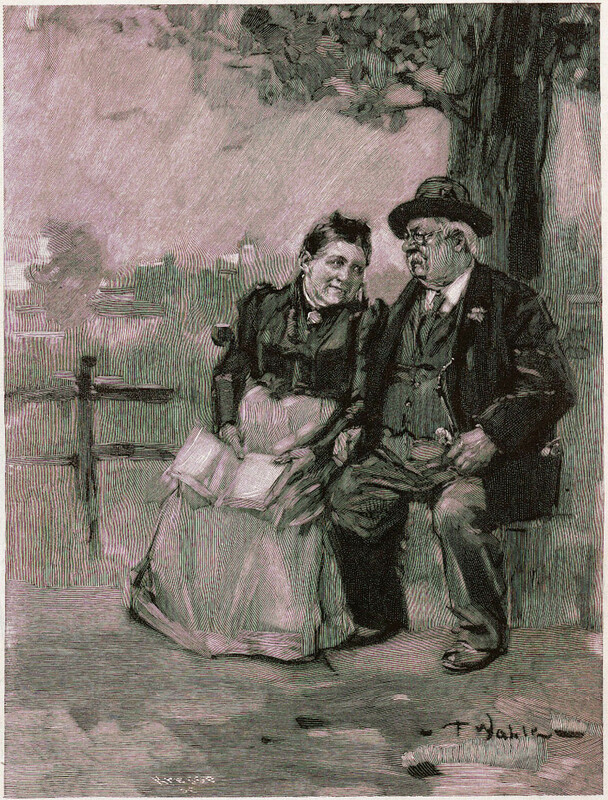 Horst Uhr notes in the biography that this caricature has elements of the Jugendstil with its “curvilinear patterns and capricious arabesques” and may have been a playful jaunt by Corinth into that style. However, Corinth and the other Secessionists were decidedly modern. They wanted to pursue art outside the traditional and academic style which meant they were more aligned with the Impressionist movement. 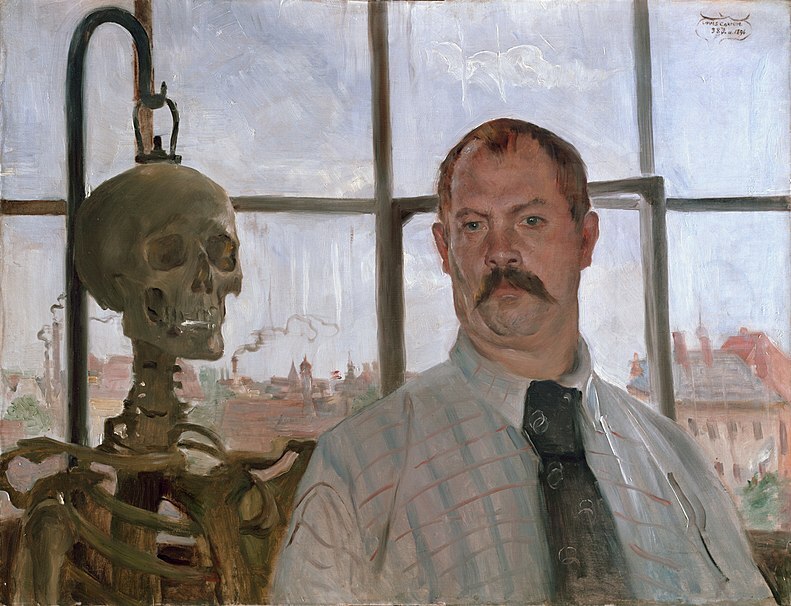 Even still, Corinth’s incredible self-portrait below with a skeleton looks contemporary even by 21st century standards. 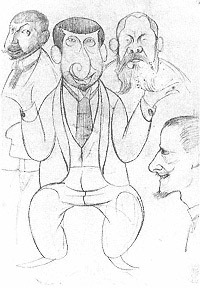 Given the associations of the other men in the caricature, I would be surprised if Wahle was not a part of the Secessionist art movement in Munich at the time. Since Corinth, Eichfield and Becker were also very involved in the foundation of this movement, Wahle may have been more connected than I first envisioned and definitely more than just a commercial artist for magazines. It’s interesting what kind of clues you can get from a little cartoon portrait! 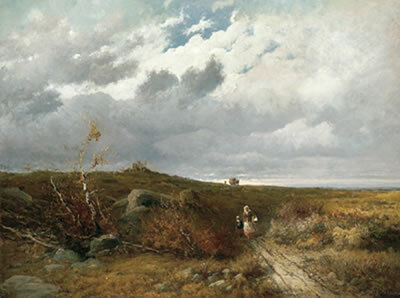 Hermann Eichfeld, "Country Road with Approaching Storm", 1895. 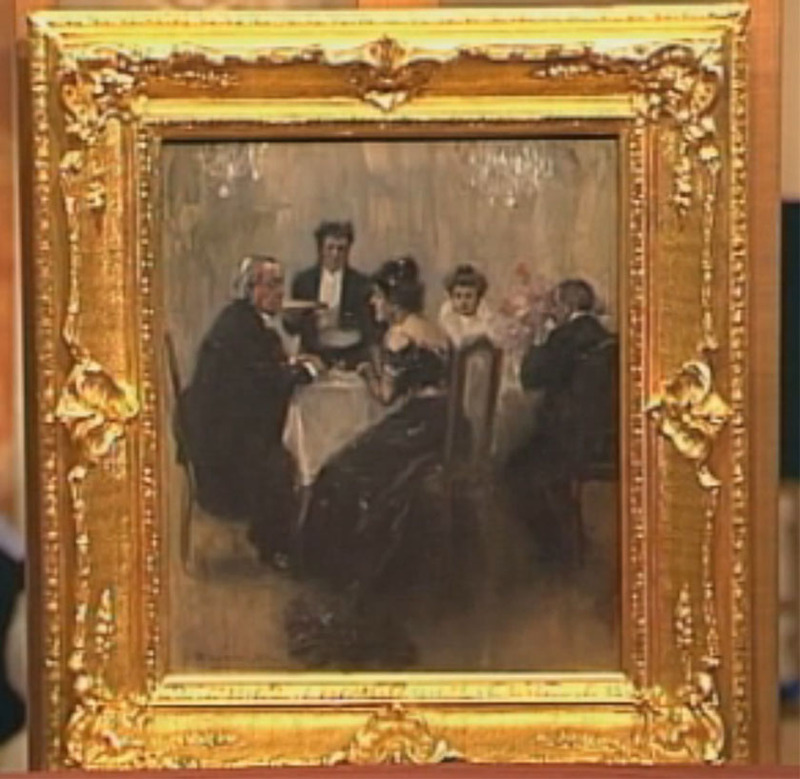 Sold at auction in 2009. Lovis Corinth, Caricatures , c. 1896. Pencil, 32.6 × 23.7 cm. Formerly Collection Johannes Guthmann, Ebenhausen; present whereabouts unknown. Photo courtesy Hans-Jürgen Imiela. Appears on page 87 of  below. Uhr, Horst. 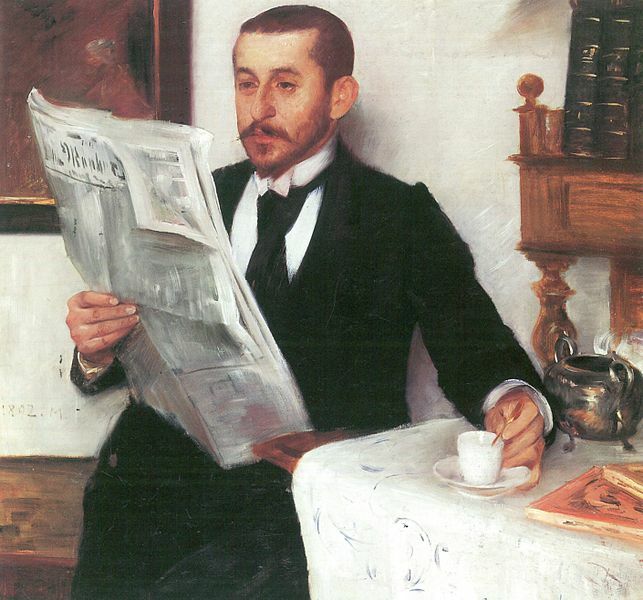 Lovis Corinth. Berkeley: University of California Press, 1990. Full text here. Its humor is thus spontaneous, natural, and universal. Its contributors are found in every rank – men and women, rich and poor, young and old. None is too wise and no too lowly to send the joke of the day to this paper. Thankfully the Heidelberg University Library has the entire 100 year run digitized and online so I have been flipping through some issues, focusing mainly on years which Wahle was probably active. 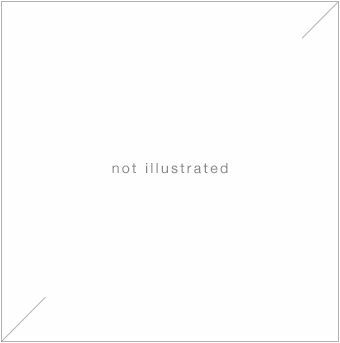 The illustrations are fantastic! The journal is approximately half text and half drawings which range from little comical sketches to full page paintings. The art definitely gets larger and more elaborate as the years progress. 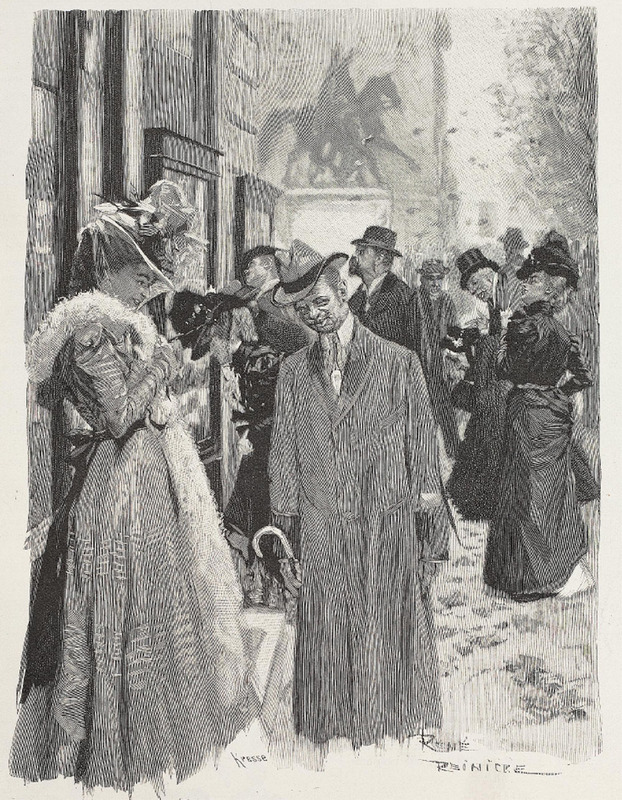 The images mostly feature daily life focusing on people presumably involved in the corresponding stories, with a few fantasy images thrown in as well. I am recognizing the artists from issue to issue so at least there was a set of professional illustrators that worked for the journal. 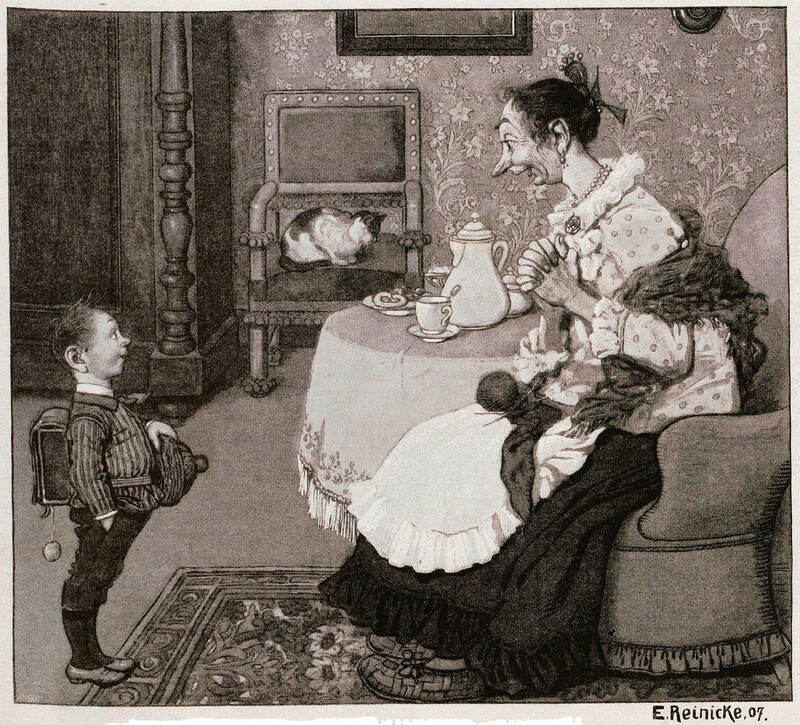 I’ve noticed that Emil Reinicke draws humorous, folksy caricatures of everyday people. The scenes and situations depicted are a little goofy but expertly drawn in a stylized way. Although I’m unsure of the spelling of his name, H. Soblittgen contributes some great ink drawings of society life. One of the most skilled and most frequently featured artist appears to be René Reinicke. I’m not sure if he’s related to Emil above, but given his lifespan (1860-1926), R. Reinicke would have been a contemporary of Wahle. In some sources he is listed as a primary Fliegende Blätter artist. His style is similar to Wahle’s but subject matter tends to be very grand. 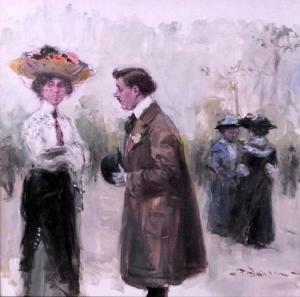 R. Reinicke paints formal balls and outdoor scenes with everyone wearing the height of fashion. Having gone through a few random years, I have seen about 40 Wahle paintings. On average, he was publishing 18 paintings a year in Fliegende Blätter but it was variable. Sometimes there are 4-6 paintings in one month followed by a 4month absence. I remain impressed with the quality and variety of his works. Of course, my focus right now in going through issues of Fliegende Blätter is to find and catalog Wahle’s works. 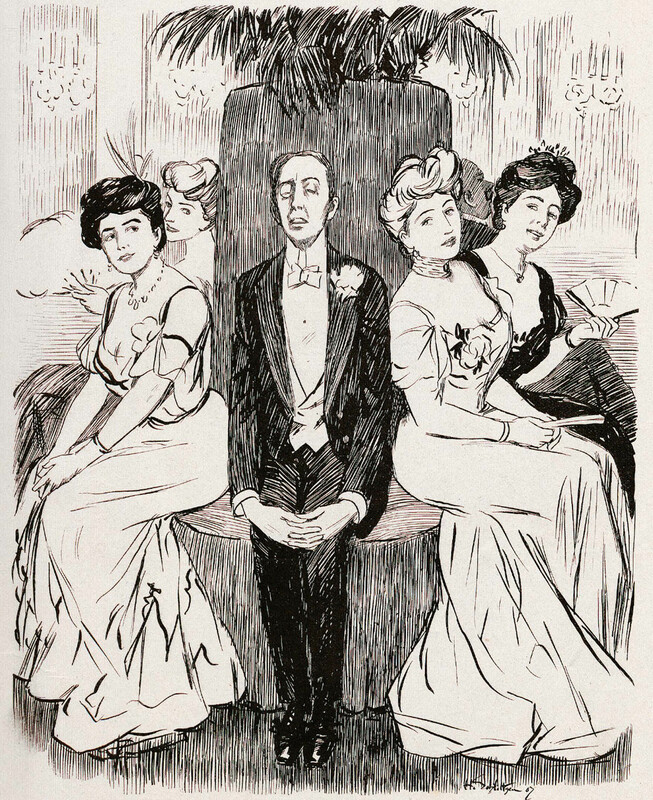 Regardless, I’m already noticing how the journal’s illustrations evolved over decades and were influenced by the Art Nouveau movement. There are some reoccurring characters (including one drawn by Wahle) that I’ll have to do a little more research on. I’m also curious to see how this comic, sometimes whimsical, journal handles World War I and II given that it published straight through to 1944. At the very least, I am definitely on the right track for understanding Friedrich Wahle’s style and putting together his portfolio. Who knows, The Discourse may be in one of these issues!